This is a comprehensive guide and permanent resource for all students of the Native American Flute. All Instruction is offered in a pleasant, concise and easy to understand language and format for learning to play. 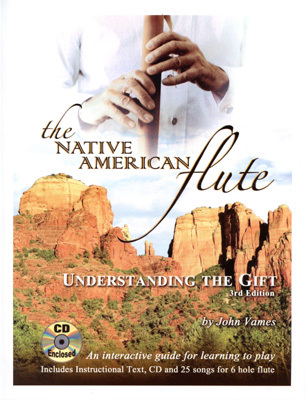 It is a book that will answer a large and growing demand for a text and CD to benefit all of the following: the Beginner who has little or no experience playing a musical instrument, the Intermediate player who wants to fill gaps and add to his or her knowledge of how the Native American Flute works, how music works, and how to put the two together, and the Advanced player who wants to teach others how to play but up until now did not have a clear-cut format to do so. Revised 3rd edition. 104 pages. Instructional text include 25 sheet music scores for the 6-hole Native American flute with companion 39 track CD.